Klootchman Park is a small park tucked away just west of Lighthouse Park. It's not a park in the traditional sense (no swings or concessions), but rather a small natural wilderness area by the ocean. A rustic, narrow trail leads you down to oceanside cliffs amongst hemlocks, cedars, and lots of arbutus trees. Breathtaking views of the ocean, and of the ferries departing for Vancouver Island. Even as a adult the steep cliffs of Klootchman Park makes me nervous. I think this park is best for older children (10 years old and up). There is very limited road parking. Located just west of Lighthouse Park, the trail to Klootchman Park is at the intersection of Howe Sound Lane and The Byway. West coast vegetation at its best. 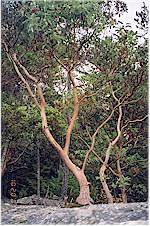 Marvel at the barkless arbutus trees, and views all the way to Vancouver Island. Imagine this: meditating on the meaning of life on a bluff above the ocean surrounded by beautiful arbutus trees, and hearing nothing but lapping waves and singing birds...with 3 kids, good luck!